Western blot analysis of extracts from 293 cells, untreated or treated with 20% FBS for the indiccated time, using , Phospho-S6 Ribosomal Protein (Ser235/236) Antibody (upper) or Phospho-S6 Ribosomal Protein (Ser240/244) Antibody #2215 (lower). 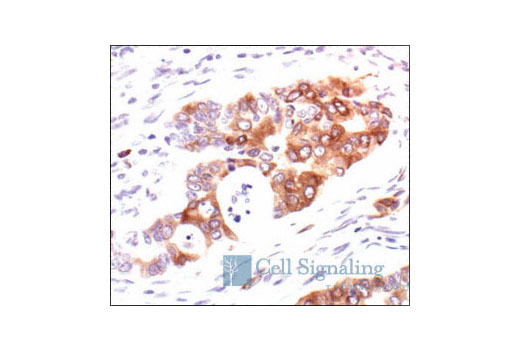 Immunohistochemical staining of paraffin-embedded human melanoma, showing cytoplasmic localization of phosphorylated S6 ribosomal protein, using Phospho-S6 Ribosomal Protein (Ser235/236) Antibody. 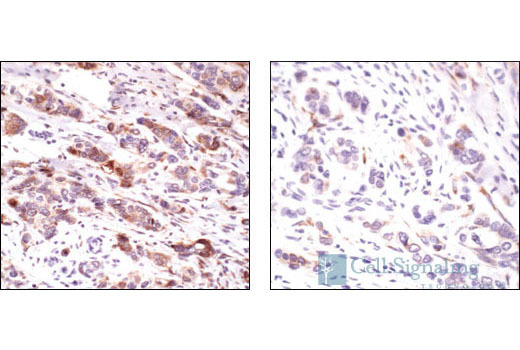 Immunohistochemical analysis of paraffin-embedded human breast carcinoma, untreated (left) or calf-intestinal phosphatase (CIP) treated (right), using Phospho-S6 Ribosomal Protein (Ser235/236) Antibody. 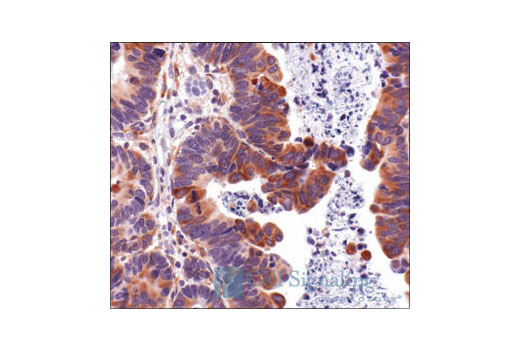 Immunohistochemical analysis of paraffin-embedded human colon carcinoma, using Phospho-S6 Ribosomal Protein (Ser235/236) Antibody. 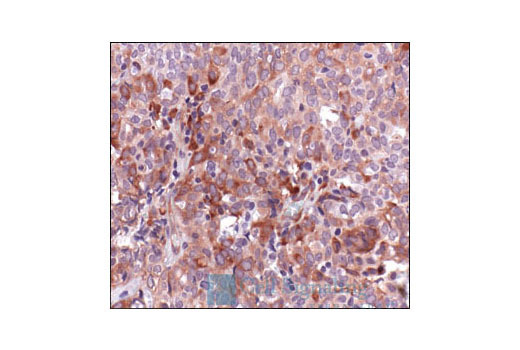 Immunohistochemical analysis of paraffin-embedded human renal cell carcinoma, using Phospho-S6 Ribosomal Protein (Ser235/236) Antibody. 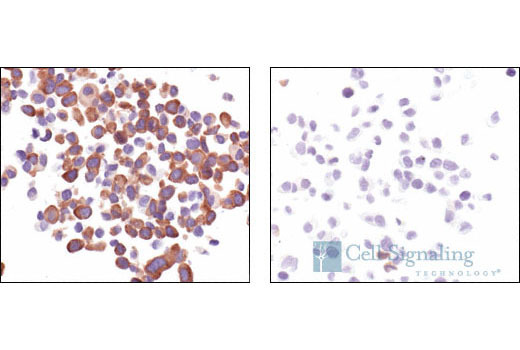 Immunohistochemical analysis of paraffin-embedded LNCaP cells, untreated (left) or rapamycin-treated (right), using Phospho-S6 Ribosomal Protein (Ser235/236) Antibody. 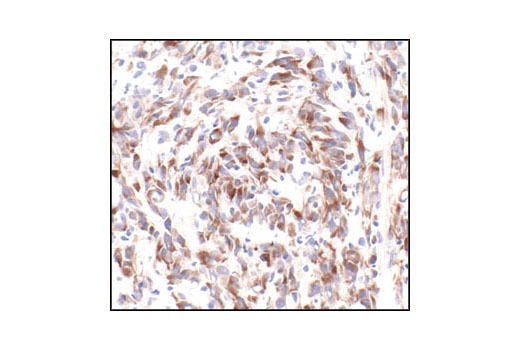 Immunohistochemical analysis of paraffin-embedded human lung carcinoma, using Phospho-S6 Ribosomal Protein (Ser235/236) Antibody. Imunohistochemical analysis of paraffin-embedded human ovarian carcinoma, using Phospho-S6 Ribosomal Protein (Ser235/236) Antibody. 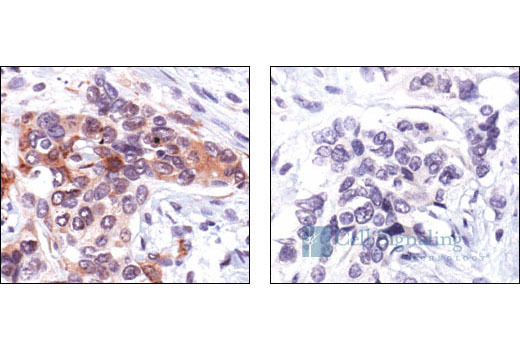 Immunohistochemical analysis of paraffin-embedded human breast carcinoma, using Phospho-S6 Ribosomal Protein (Ser235/236) Antibody preincubated with control peptide (left) or Phospho-S6 Ribosomal Protein (Ser235/236) Blocking Peptide #1220 (right). 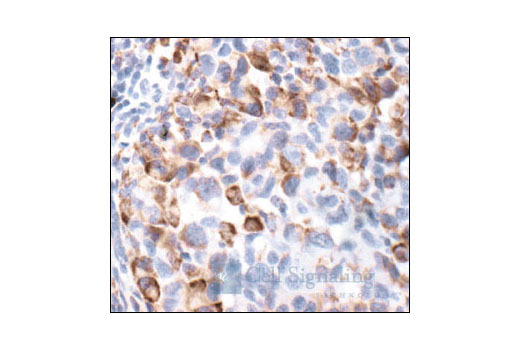 Immunohistochemical analysis of frozen U87MG xenograft, using Phospho-S6 Ribosomal Protein (Ser235/236) Antibody. 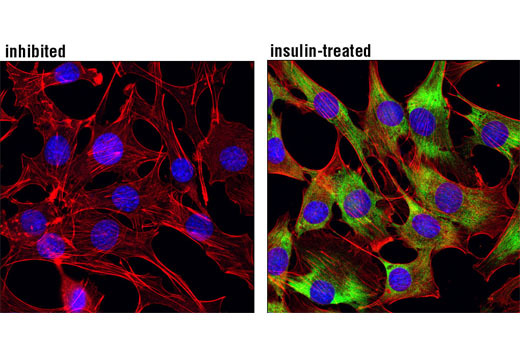 Confocal immunofluorescent analysis of C2C12 cells, either U0126/LY294002/Rapamycin-treated (left) or insulin-treated (right), using Phospho-S6 Ribosomal Protein (Ser235/236) Antibody (green). Actin filaments have been labeled with Alexa Fluor 555 phalloidin (red). Blue pseudocolor = DRAQ5® #4084 (fluorescent DNA dye). Flow cytometric analysis of NIH/3T3 cells, U0126- and Rapamycin-treated (blue) or serum-treated (green), using Phospho-S6 Ribosomal Protein (Ser235/236) Antibody compared to a nonspecific negative control antibody (red). 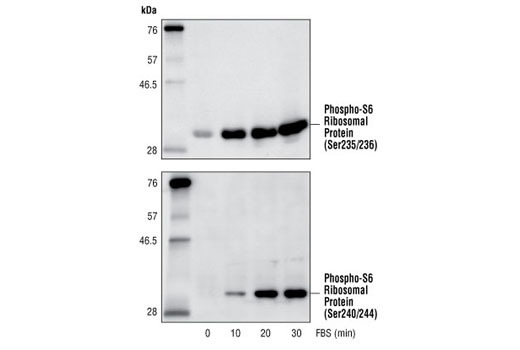 Phospho-S6 Ribosomal Protein (Ser235/236) Antibody detects endogenous levels of ribosomal protein S6 only when phosphorylated at serine 235 and 236. 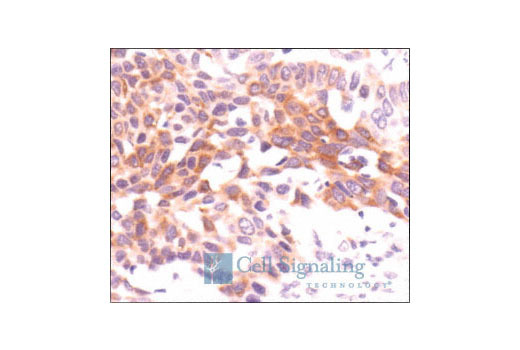 This antibody does not detect ribosomal protein S6 phosphorylated at other sites. Polyclonal antibodies are produced by immunizing animals with a synthetic phosphopeptide corresponding to residues surrounding Ser235 and Ser236 of human ribosomal protein S6. Antibodies are purified by protein A and peptide affinity chromatography.